Well, I thought it was a long trip to Bangkok, but Pakse has given BKK a run for the spot! 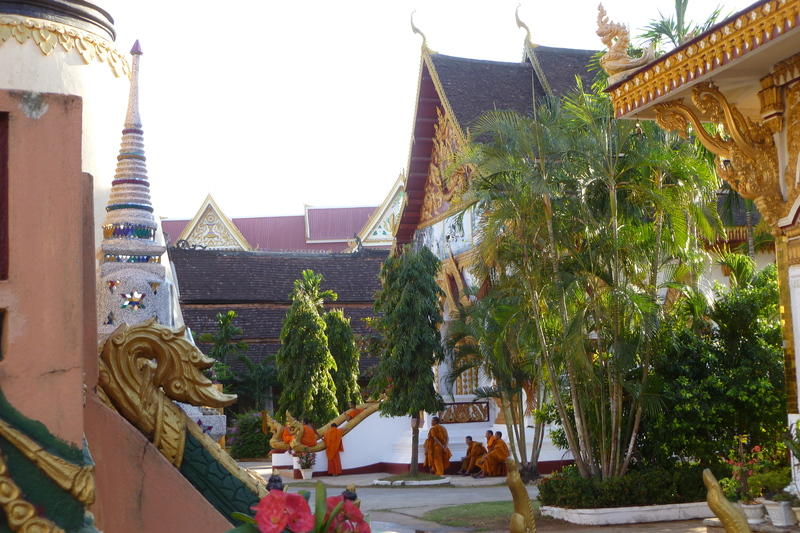 And no matter, I would have taken double the time to be here – so delighted as I am to have left the big, bustling city behind and be here in southern Laos in the small city (50,000 or so) of Pakse. While Pakse itself is not particularly picturesque or charming on its own, it’s the frontier town to the Bolavan Plateau, a gorgeous wide-open area of mostly agriculture and the might Mekong River. I arrived in early afternoon and am pleased as I can be to be here! Staying with Mr. Vong at the Saibady 2 for a whopping $3 and change per night. 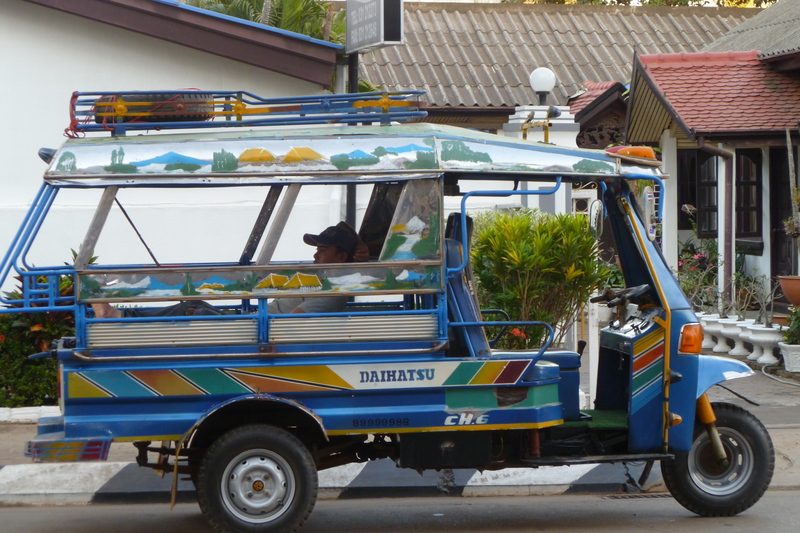 It would have been double that, but a woman getting off our final bus here in Pakse was talking to a tuk-tuk driver and asked to be taken to Saibady – I chimed in and said I was going to the same place, so why not share the ride. Well, we decided not only to share the ride, but the room as well – Mr. Vong suggested it and we thought, why not? She’s a young, sweet Swiss woman traveling around on her own as well after some months with her boyfriend in India. 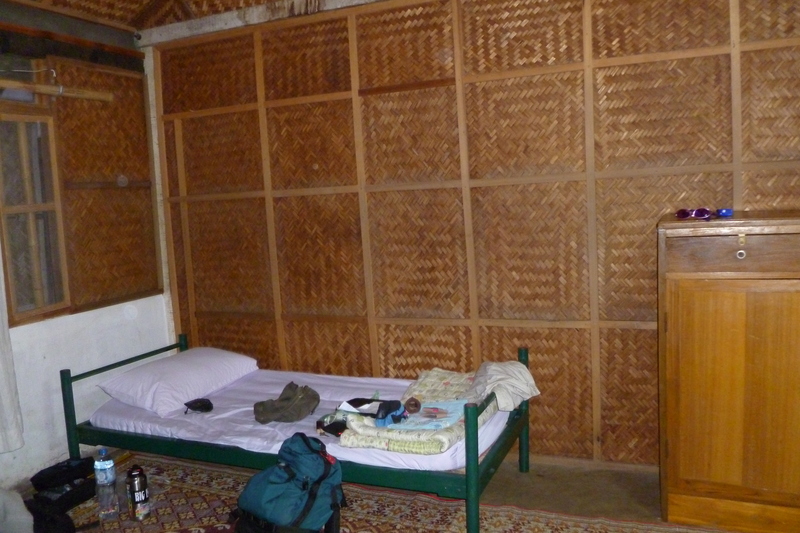 My modest room at the Saibady 2 in Pakse - luxury compared to my train bed last night! So, back to my getting here to Pakse – a taxi to the train station with a young Thai man trying to practice his English that was horrible, at best. He kept giggling sillily each time he said a word “correctly” and loved learning the word ‘thirty’ for his age – amazing how hard that -th sound is for non-English speakers. Okay, so to the train station easily enough – found a quick meal of noodles and vegies and to the train I went. Unfortunately, I booked only that afternoon, so I had to take an upper berth, but no worries, I thought! But then, there was the getting to the upper berth – on a ladder that was wide enough, maybe and only maybe, for my cat Pono. But definitely not for his chubbier sister, Makana. As for me, being a ‘traditionally-built woman,’ I couldn’t quite imagine how I was gonna hoist myself up there. But hoist myself I did, of course, although I almost went flying in the middle of the night when I needed to get up to pee. 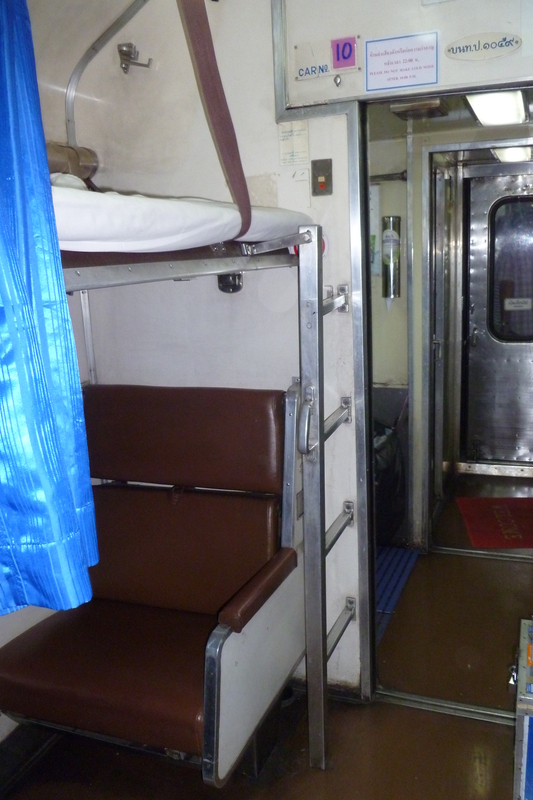 The upper berth was not only upper but also much narrower than the lower. So here’s a thin, small Thai woman below me and the Mediterranean up north – yes, life is just not fair! I dared not turn over or move in the night at all, lest I really go flying and fall right off. But all was well – no accidents, no falls and being the only Caucasian in the car brought me enough attention without antics like that that would have caused even more of a stir! My palatial train berth! 2nd Class all the way! The train ride was 12 hours to Ubon Ratchathani where I took a 1/2 hour tuk-tuk ride to the bus station – here I am sitting in tbe back of a rickety old contraption with a man I just trust will take me to the right place. I’m aware of this in the moment and I love the trust that is required and that I offer up some freely. Not carelessly, intuitively, but freely for sure. From there, I proceeded to get on the wrong bus, with my bag stuffed into the back, only to realize this as the bus was getting ready to pull out – the very unhelpful bus assistant kept pushing me to the back of the bus to retrieve my bag, which I clearly couldn’t reach – a fellow traveler saw my plight, climbed onto the mountain of bags and pulled mine out, with the quip – “That’ll cost you a beer in Pakse!” “Only too gladly, dear sir, many thanks!” And off I was pushed of the bus to wait for the next one to Pakse. Another half-hour wait for the bus and I happily get on it, relieved to be at one with my bag! 3 1/2 hours later, we arrive at the Lao border, where we have to walk across the border and the bus driver promises to meet us on the other side. Total chaos at the passport, immigration and visa lines – no, no, not there, here, not here, there! Finally, after a minimal bribe I decide is not worth arguing about (very important to learn when to let go of these sorts of things and when to push! ), I am on my way! Having not eaten this whole day, Yasmin (my new Swiss roommate) and I decide to go off and find food and the bank. We take care of our banking business first and we then stumble onto a fabulous Indian restaurant – Indian in Laos? Ohsure, why not! and we proceed to have an amazing Indian lunch of aloo gobi, garlic naan and a big bottle of water for less than $2!! Totally satiated, a quick return to the Guest House for a lovely introduction to the area from Mr. Vong and an invitation to join the all-day tour he’s offering tomorrow. He’s quite the man about this area, clearly loves what he’s doing and is also very involved in building a local school. In fact, a donation of $1.25 to the school gets you wifi access while you stay here – I was only too eager to support that! I headed out then to meander the streets of the town, so happy to see the smiling faces of children and elders alike when they saw me walking their way – a far cry from the anonymity I felt in Bangkok! I stumbled upon an amazing temple (they’re everywhere here in SEA – gorgeous monuments and saffron-covered monks all about). I found the fancy hotel and it’s panoramic roof-top and the massage place which I will save for tomorrow after the full day of touring around; which in my leisurely walking, decided would be a fine idea for tomorrow. Oh, this is fun … that fellow traveler I was speaking of earlier who rescued my bag just walked in the Guest House. “I think I owe you a beer!” Not tonight, but perhaps tomorrow as he and his wife will take the tour with me. They’re an older couple, in their 60’s or so, I’d say … no, not that 60’s is older, but on what can be primarily a 20-something backpacker trail, I’m delighted to see people in my age out here, too! That’s it for me for tonight – I need a good night’s sleep and I think I’ll go and find a little snack in town before I call it a night and who knows, maybe even another haircut! A few more shots of Pakse and I’m calling it a day! The other photos are being cranky about uploading, so I’m letting it go for now! Off to eat and plan my next many days in this area! Wow – love the pics along with the stories! It sounds like the ordeal of getting to Pakse was certainly worth it! I love the pictures! Ooh, vicarious thrills. I love it! I’m loving hearing all your details…and the fact that you’ve been on the road for such a short time and already you’re running into people you’ve met before! It reminds us truly how small the world can be! Keep those pictures coming. I’ve printed up a map of the countries you’re visiting so I’m sort of following along from this end. It’s fun!